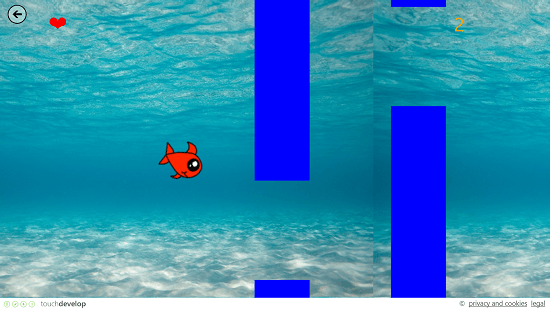 Silly Fish is a free Flappy Bird like game for Windows 8 and 8.1 where you have to make the fish swim through the underwater obstacles. When you run the game on your device, you will be presented with an interface where you can directly start the game itself. The gameplay interface is rather simple allowing you to easily control the fish by simply tapping on the screen of your device, or by rapidly clicking on the screen which makes the fish swim upwards per click or tap. Your score will be visible to you at the top right screen corner and at the end of the level you will be shown your level statistics with an option to restart the level or go back to the main menu. Silly Fish is available for free from the Windows App Store. When you install and launch the Silly Fish game app on your device, you will be presented with a screen which resembles the screenshot shown below. Simply tap on the Silly Fish tile at the top left corner, and soon enough you will be taken to the gameplay screen of the game. Once there, you will be able to see a screen which resembles the below screenshot. In the above screen, you have to control the fish by making it swim through the obstacles. This can be achieved by clicking or tapping rapidly on the screen to keep the fish swimming. The more rapidly you click or tap on the screen, the higher the fish will rise in the water. You have to achieve the highest score possible without hitting any obstacles. The score is visible at the top right corner. You can return to the main screen of the app at any point of time by clicking on the back arrow button at the top left corner of the screen. If you happen to crash on any obstacles or fall on the sea floor, it’s game over and you will be shown a prompt which is shown in the screenshot below. In the above prompt, you are shown your score along with an option to restart the level or to go back to the main menu of the game itself. 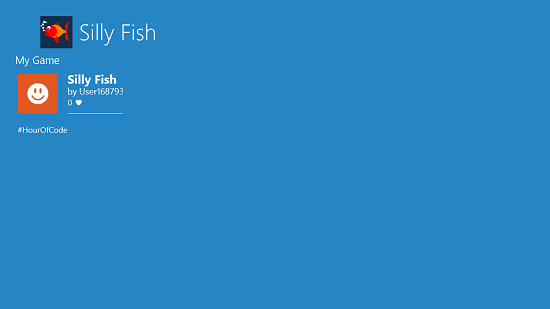 This pretty much winds up the main features of Silly Fish for Windows 8 and 8.1. 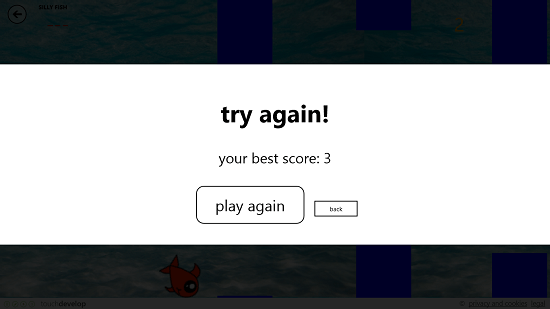 Silly Fish is a well-designed game for Windows 8 and 8.1 which can be downloaded for free from the Windows App Store. You can feel free to visit the link below and download it for free for your device!